Hello and welcome to the 105th installment of the SWD. Syrian Arab Army advanced northwest of Maskanah and captured Rasm Ayn Ahmar village and sugar factory from Islamic State. 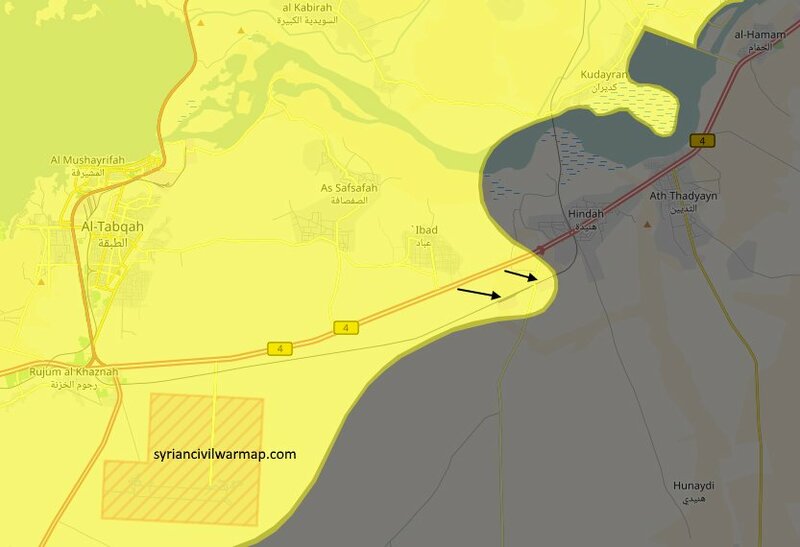 Syrian Democratic Forces reportedly captured Hindah Train Station, Sadkob Fuel Company and Hindah Grain Silos, east of Tabqa from Islamic State. United States’ artillery heavily shelled the city of Raqqa last night, at least 90 projectiles fell on Raqqa, including some on residential areas. CJTF-OIR‘s warplanes also participated in last night’s targeting of Raqqa. According to Amaq, 74 US’ artillery shells fell on Raqqa and caused at least 17 civilian casualties. Syrian Democratic Forces found a mass grave east of Tabqa Air Base allegedly consisting of 270 SAA soldiers executed by Islamic State when air base fell under their control in August of 2014. However, the execution of SAA soldiers captured in Tabqa Air Base was reportedly geolocated to Ma’amal al-Qarmeed, around 5 kilometers (~3.1 miles) east of Raqqa. Location of Ma’amal al-Qarmeed can be found here. Last night, unknown gunmen wounded Sheikh Nasser Hamadeh, a commander in Liwa Omar, part of Ahrar al-Sham. Hamadeh was wounded in Kafr Batikh and transferred to Bab al-Hawa hospital. This is the second assassination in Kafr Batikh this week, on the 23rd of May, unknown gunmen opened fire and wounded Jaysh al-Nasr’s 1st Lieutenant Alaa Rahmoun in front of his house. Katibat Aswad Al-Tawhid, affiliated with Liwa al-Muthna which is affiliated with Ahrar al-Sham, defected and joined Hayat Tahrir al-Sham. 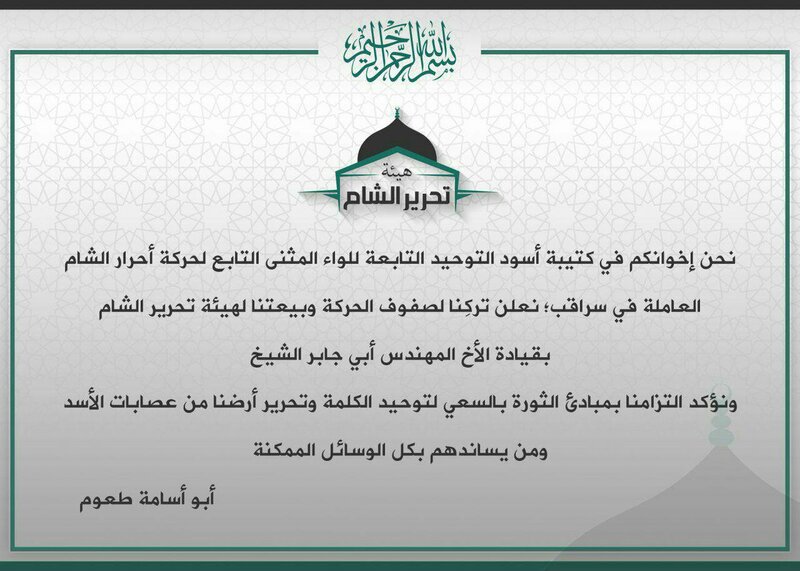 Defection was confirmed by a statement from Hayat Tahrir al-Sham. Katibat Aswad Al-Tawhid operates in Saraqib and is commanded by Abu Jabr al-Sheikh. The last, fourth batch of rebels and civilians is expected to leave Barzeh neighborhood tomorrow towards rebel-held Idlib or Jarablus. Reports are indicating that negotiations are taking place between Syrian government’s National Reconciliation Committee and rebels represented by Jaysh al-Islam and Quwwat al-Shahid Ahmad al-Abdo, negotiations are regarding the rebel East Qalamoun pocket newly-surrounded by Syrian Arab Army. The negotiations are reportedly sponsored by Russia which would mean deployment of Russian Military Police if any kind of deal is achieved. 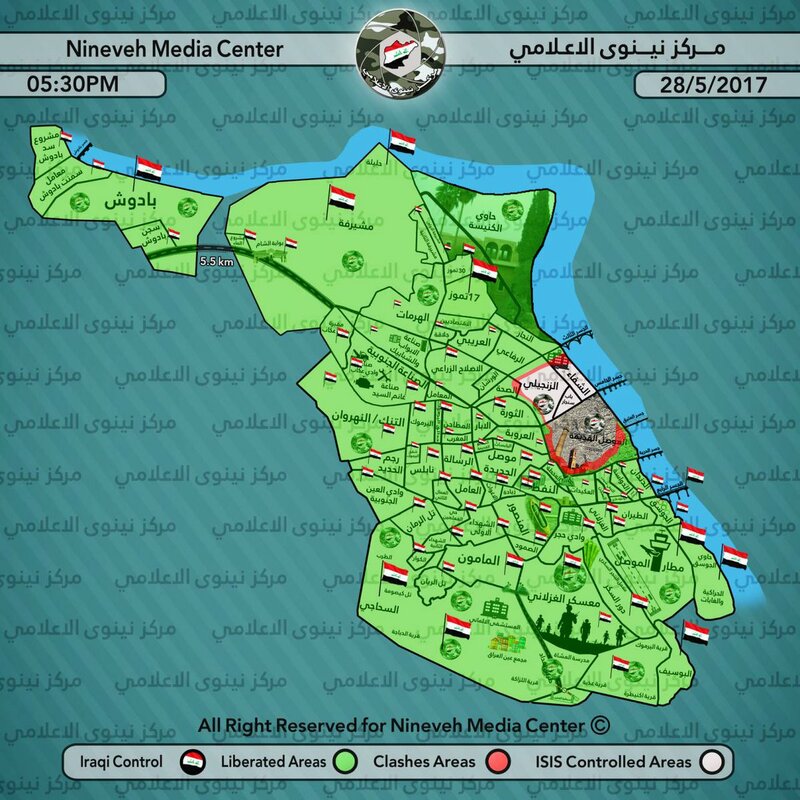 After yesterday’s advances north of Old Mosul district, Iraqi forces are now preparing for an assault on the district itself, according to reports. Islamic State launched an attack in Bab al-Toub neighborhood, Old Mosul district, reportedly killing eight Iraqi soldiers and wounding several more. Reports from Mosul suggest that IS committed another massacre against Iraqi civilians, 16 civilians were allegedly executed as they tried to flee from IS-held areas in west Mosul. According to Amaq Agency, IS and Iraqi forces clashed at the outskirts of Al-Zanjili district, the latter allegedly lost five soldiers in clashes. Another statement from Amaq claimed death of 12 Iraqi soldiers due to IS’ snipers in Al-Najjar and Al-Zanjili districts. Iraqi security forces arrested a number of IS’ fighters trying to flee west Mosul, fighters were among the civilians evacuating to safety. Among the arrested IS’ fighters was a senior commander Salim Sahib Abid Allah. Al-Hashd al-Shaabi (Popular Mobilization Units) captured Al-Qahtaniya region from Islamic State, officially announced by Iraq Joint Operations. Furthermore, Al-Jazirah was also captured by Iraqi forces. AL-Hashd al-Shaabi’s report for today states that 19 IS fighters were killed in clashes during the advances as well as one technical destroyed and two mortars. Yazidi unit “Mum Qasim Shafan” defected from Peshmerga and joined Al-Hashd al-Shaabi. Islamic State launched an attack near Tuz Khurmatu against Peshmerga stationed there, Amaq claimed death of at least 10 members of Peshmerga, including an officer and destruction of four vehicles. Kurdish sources reported that only seven Peshmerga soldiers were wounded during IS’ attack which was repelled. Islamic State suicide bomber detonated himself in the center of Baqubah, killing four and wounding 14 civilians according to Iraqi sources. Islamic State’s Amaq claimed the attack killed an Iraqi Federal Police officer and other 12 policemen as well as wounded another 18. In another event north of Baqubah, around Qara Tuba, IS’ reportedly killed two Iraqi Army’s spies. On the 27th of May 2017 CJTF-OIR has conducted 17 strikes in Syria. CJTF-OIR‘s main focus in Syria at the moment is Tabqa-Raqqa-Deir al-Zour region where they did 17 strikes supporting SDF‘s operation against IS destroying four IS well heads, six fighting positions, three ISIS headquarters, an IS staging area and a VBIED.